We women are the most unfortunate. the ruler of our bodies. And this misfortune adds still more troubles to the grief we have. we've selected, is he good or bad? For a divorce loses women all respect, yet we can't refuse to take a husband. I know it makes for a strange film review – beginning with a rather long quote from a famous Greek drama written hundreds and hundreds of years before the time period of the film Belle (the late-18th century) and seemingly several other worlds away from each other thematically and culturally. When Belle’s white, close-as-a-sister cousin Elizabeth Murray (Sarah Gadon) drops that speech in the buggy about women having so few options and how they must rely on making a good marriage [read money and a proper family name], my mind leapt right to Madea’s speech where she makes her impassioned speech to the women of Corinth about traitorous husband Jason and signifies on gender politics. Belle, notwithstanding that it is not a book nor play adaptation but a story based on the real life of Dido Elizabeth Belle, shares the play’s remonstrations about the plight of women and the patriarchal and class realities that dictate their fate. Both play and film also depict women who end up challenging that status quo. Belle, however, a British film directed by Amma Asante and written by Misan Sagay offers insight into the tragicomic inner workings of the domestic and public sphere that traverses beyond witty engagement of the gender and class politics that govern social discourse and behavior and the law. Belle (Gugu Mbatha-Raw) is a mixed race insider/outsider whose class privilege by blood [a white Royal Navy father] yet illegitimacy and blackness by blood [slave mother] leave her vulnerable to the contradictions of an upper middle class society dependent on the economic boon of the Atlantic slave trade yet conflicted internally by its moral implications within a ‘Christian’ society. Belle and Elizabeth come of age and their romantic lives unfold and intertwine with these issues. Their great uncle, Lord Mansfield (veteran actor Tom Wilkinson), is the chief justice of England who raises Belle then comes to reside over an infamous case. Slave ship traders’ are appealing a ruling that allowed their insurance company to not pay on a murdered cargo of slaves. Were they murdered with the motive being fraud or out of necessity to save the white traders’ lives when resources aboard ship became scarce? At its best, Belle achieves that literary feel and visual elegance that defines other notable period melodramas depicting late-18th, early 19th century English culture and its contradictions most famously in adaptations of Jane Austen’s novels, including Sense and Sensibility and Pride and Prejudice. At points, Belle perhaps strives too hard to affect the mannerisms, ironic humor, wit, and romance that define Austen literature and the best screen versions of it and misses the stylistic subtlety, the infuriating, delicious understatement that make it worth the wait when the heroine and her noble gentleman finally confront love. Of course, the stakes are much different, higher, in Belle, which invokes the tragic mulatto construct that dominated early-twentieth century literature and classical Hollywood era films like Showboat and Imitation of Life. 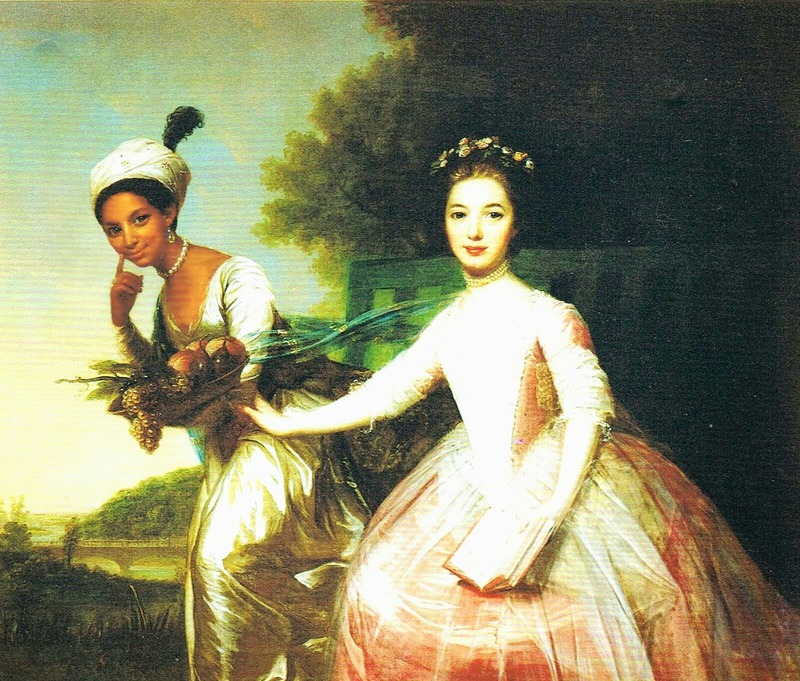 The real Dido Elizabeth Belle's life with her white kin is mired in some ambivalence. It's believed she was to some measure treated as one of the family and a companion for her cousin. In the film, Belle’s situation is defined by her in-between status and the contradicting racialized class mores her loving relatives follow. They insist on sending her to “eat in the kitchen when company comes’ to paraphrase a poem by Langston Hughes. They devalue her as a potential wife to an acceptable [white] gentleman until one finds her money (her dead father’s allowance) and attractiveness enough to overlook her illegitimacy and blackness. In one scene, Belle sits at a mirror, horrified by her reflection; she claws at her skin seemingly confused and overwrought by the visible evidence of her difference, the burden of her racial heritage. The issues of race and slavery are personified in the portraits of all her kin that dominate the family mansion. They become haunting metaphors for her growing angst and awareness; a number of the paintings feature a soot black servant kneeling adoringly at the feet of their white masters and mistresses or hovering in the background like shadowy apparitions bearing fruit or flowers. Is her status merely a more class-privileged version of the black figures in the painting? The portrait she must sit for with Elizabeth serves as a metaphor for the ambivalence and contradictions that her race and illegitimacy impose upon her status within the family and larger society. It worries her as she poses for the portrait, dreading how it will configure her. Into all this angst comes a romance between Belle and John Davinier (the name of Dido’s real life husband), whom the film takes the liberty of casting as the catalyst for Belle’s awakening to her own precarious, if privileged status, and the moral implications of the legal system of slavery. In real life, her husband does not appear to have been either a vicar's son or an abolitionist activist. Davinier (Sam Reid) is a familiar representation in contemporary films depicting legal battles surrounding slavery [think Lincoln, Amistad]; he’s the super noble if impetuous liberal white guy with the all-consuming desire to stamp out slavery and recognize the humanness and equality of all human beings regardless of race or class. That’s not to deny that there were very important and passionate anti-slavery white guys on both sides of the ocean. Davinier's characterization perhaps takes its cue from the real life English abolitionist Granville Sharp who got involved in the case that proved pivotal to the movement against slavery in England. The problem is that this Hollywood-ish archetype, the noble white hero and most passionate anti-slavery-crusader-in-the-world archetype has become an annoyingly overplayed plot device, taking center stage and serving to diminish the roles of others [especially black abolitionists abroad or in America] as well as the contradictions that white liberalism presented in regard to issues of race, slavery and equality. This character staple suggests a “cinema of accommodation” – that’s the fancy term a filmmaker-film loving buddy of mine came up with when I ranted a little about it to him. How would a film about such subjects look minus the over-reliance of that familiar formulaic archetype? What if Belle had resisted that device and also chose not to the offer the simple, easy portrayal of Belle's roots as the product of a taboo true love between a noble, duty bound, loving but regrettably absent Navy officer and an enslaved black mother? Davinier tries to sway Mansfield to rule on a higher moral ground and quickly wins Belle’s attentions then affection. The dramatic shift that Asante and Sagay take in the real circumstances of the 1772 case sets the stage for relying upon, and overplaying the archetype. The real case took up the issue of whether slaves purchased in the colonies were bound by English common law through the case of James Somerset, an enslaved black man who had been purchased in Boston but then who escaped in England after being brought there by his master. Near the end of the film, the portrait is finished and the image of the two sisters, sitting almost side by side [Belle minus kneeling or bearing fruit] overtly points to the impending change in English society regarding slavery and answers the question of Belle’s status in the family positively. Through first the white father’s blood then love bred through domestic intimacy, Belle is more one of them, more alike them than not. It’s another unnecessary instance of over-romanticizing history. The real painting of the two women features a light-skinned Belle smiling ever so slightly mischievously. She wears a turban on her head with a blue feather sticking out if it, and she’s holding a basket of fruit and standing leaning forward slightly away from the cousin [true not on her knees, at the cousin’s feet, or gazing adoringly at her cousin]. Elizabeth’s white hand reaches out resting on Belle’s wrist. At the end of the film, both portraits are juxtaposed across the screen and the contrast is sharp. Both do suggest the familial intimacy of the two cousins. Does the original make clear the true nature of Dido’s place within her family and the household? The original painting, with its hints of exoticism and servitude – familiar artistic conventions - suggests that Dido’s femininity, personhood, and family status was perceived quite differently from her white cousin, yet she was not relegated either to shadowy or merely servant status. However, since the film invests so heavily in driving home the intrinsic value of Belle and the wrongness of slavery no matter its economic profit, the film’s portrait had to differ dramatically from the original and have a more certain implication. The ambiguity of the real portrait is erased, resulting in a hopeful, less complex representation of England’s path to the abolition of slavery. Belle is indeed a pretty film and an attractive canvass not merely as a break out role for Gugu Mbatha-Raw, but for admirably skimming the history of the most profound modern influence on the economic, social, political, and cultural structure of English and American society, the Atlantic slave trade, and oh my, with some attention to the intersection of race, class, and gender politics - along the way to appropriate true love, of course.